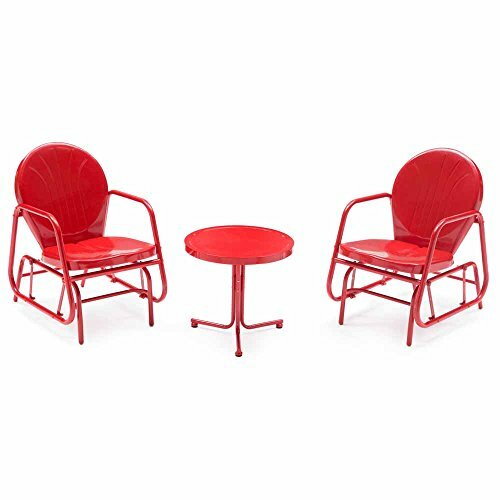 Vintage Single Glider Chat Set (Red) for patio outdoor/backyard furniture single seat glider with side table. Bold colors that add a cheery look to your backyard living. View More In Gliders, Ottomans & Rocking Chairs. The Coral Coast Vintage Retro 3 pc. Metal Glider Chair Chat Set is durable, adorable, and oh-so fun to sit in. The glider bases on this pair of chairs offer a smooth back-and-forth motion you'll love and any of the available finishes will be a real eye-catcher. Seats are slightly contoured for added comfort and this matching end table is the perfect finishing touch. Some assembly required. Glider chair dimensions: 31.5W x 21.5D x 42H inches. Table dimensions: 21L x 21W x 20H inches. Gliders: 31.5W x 21.5D x 42H in. If you have any questions about this product by Coral Coast, contact us by completing and submitting the form below. If you are looking for a specif part number, please include it with your message.